Tensile membrane structures provide endless design possibilities due to their flexible nature, naturally bright light space due to their translucency, high durability and longevity, and long spans of column free space due to being light weight resulting in the need for less structural steel. 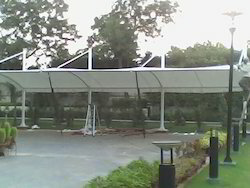 We have various sizes and designs for tensile structures. We have skilled team and high quality materials for the tensile. WE ARE MANUFACTUER OF ALL KINDS PVC TENSILE STRUCTUERS PLEASE CONTACT US FOR YOUR REQUIREMENT. 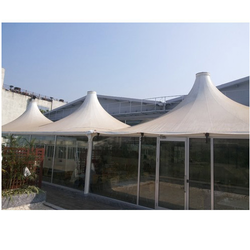 We are ranked amongst the foremost firms, engaged in offering a qualitative range of Commercial Outdoor Tensile Structure.